a) How well do you think the paper/ models described capture the important aspects of health behaviour (and what you would like to add)? b) Were there any aspects of the paper that were unclear (e.g. comprehensiveness, use of language, concepts poorly explained)? c) Do you have any thoughts on any possible applications for the work (e.g. outside of academic publication, potentially also outside of public health)? b) A questionnaire designed to explore attitudes towards seasonal flu and flu vaccination. Members of the public were recruited through Public Health England’s (PHE)’s People’s Panel as the HPRU (MM) is a partnership between Imperial College and PHE. This panel consists of approximately 500 members. Many of these members attend focus groups and complete surveys, while 20 of them sitting on working groups. We initially pitched our project ideas to the PHE People’s Panel members to elicit expressions of interest. After this, we were forwarded the application forms of all those interested (containing their experience and areas of interest) and selected who to invite to join the PPI group. Did you provide the patients/public who you involved with any training? The first meeting of the PPI group was a workshop where the group were given a presentation (in lay language) by a senior researcher on infectious disease modelling. They then had an opportunity to ask questions. All members of the PPI group were then invited to attend a one-day short course delivered by the HPRU (MM) entitled “Introduction to Infectious Disease Modelling to Inform Policy-Making” which was offered to professionals and members of the public without experience of modelling methodology. Two of the group attended. 1. Providing critical feedback concerning the presentation of the systematic literature review (i.e. its comprehensibility), the relationship between the review outcomes and the group’s expectations, and any potential applications for the review. 2. Providing critical feedback concerning the questions to be included in our study questionnaires on seasonal flu vaccination. We hoped that this would enable us to refine the measures to make sure that: a) they were comprehensible and easy to complete, and; b) they tackled constructs and issues about influenza and influenza vaccination identified as important to the context by PPI group members. What impact did the PPI have on your research? These additions in the systematic review are examples of the way in which public involvement helped to enhance the quality of our paper by ensuring it addressed factors relevant to the public. Feedback from the PPI group was also incorporated into the final versions of the study questionnaires on seasonal flu vaccination. We were able to modify the questionnaires to ensure that they were fit-for-purpose from a lay perspective, in terms of both clarity and suitability. What impact did the PPI have on the people involved? Feedback was received from some members of the PPI group concerning both our introductory workshop and subsequent teleconference meeting. PPI group members indicated that they had an improved understanding of infectious disease modelling and reported an enjoyment of the process of discussing this work in an open and friendly context. Some of the PPI group members did feel that the sessions could have done with more structure. There were also some instances where the discussions went off topic a little, leading some PPI group members to feel that their preparations for the discussions were not fully utilised. In addition, although it has been acknowledged by group members that teleconferencing (three subsequent PPI group meetings were held via teleconference) does pose challenges, some of the PPI group members fed back that it was an appropriate method of working when there was a lighter agenda. Generally speaking I’ve found the experience of doing PPI to be an enjoyable and relatively uncomplicated one (certainly with the excellent help of PERC’s Public Involvement Officers). I would say that conducting PPI in research that may be less public facing does present difficulties; however, you just need to think carefully about exactly what questions you are asking. Don’t be afraid to ask for guidance from PERC. What advice would you give others who are interested in involving the public/patients in their work? I would say definitely do it! My experience of PPI in relation to this project is that the PPI group was able to provide a series of relevant, actionable comments that improved the quality (and particularly, clarity) of the research article. I’d say that this project is proof that you can involve members of the public in research that isn’t, at first glance, public facing. The PPI group were also able to provide input into the research materials (i.e. study questionnaire) that helped us to ensure that: a) they would be clear to our study participants, and; b) they would include questions about influenza and the influenza vaccine that were identified by members of the panel as potentially important for understanding vaccination behaviour. 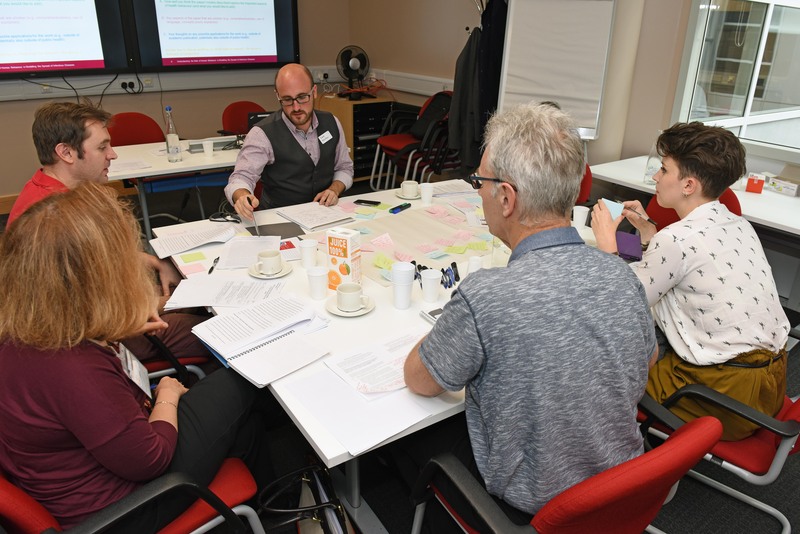 Since this workshop, we have established a new PPI project focused on involving members of the public within non-patient/public facing research (which might commonly be less amenable to PPI) within the HPRU (MM)). We are also planning to write a journal article detailing our PPI experiences to date for submission to a PPI focused journal. Series Navigation << Case Study #13: How can Patient and Public Involvement improve the study design of a clinical trial?